Introduces the basics of compiler design, concentrating on the second pass (in a typical four-pass compiler), consisting of a lexical analyzer, parser, and a code generator. Uses the C language. Appropriate for compiler courses in CS departments. For students, working engineers and programmers, this book teaches real-world compiler design concepts and implementation. 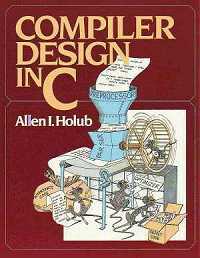 The text dedicates the first chapter to an overview of the basic concepts in C programming, and presents a complete C compiler, including the complete sources for three compiler-generation tools (written in ANSI C). It also uses LeX and yacc to develop a complete C compiler, and includes a chapter dedicated to the coverage of C++ topics and features. Allen I. Holub is a computer scientist, author, educator, and consultant. He has written extensively on the C, C++, and Java programming languages, and on object-oriented programming in general.